I completely agree with you that Time Traveller’s Wife is a great book. I read it last year on my trip to Japan and it has been the only book which I couldn’t bear to finish. I’m so glad I bought a copy for keeps haha 🙂 enjoY! i am reading this book too! 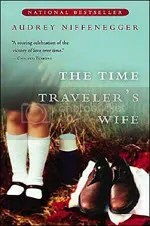 am halfway thru.. and i must say i’m intrigued..
Pingback: » The Time Traveler’s Wife movie · yannisms ahoy!